The nice thing about the Under Armour discount is that it is easy to get online and in-store. The discount is 10% off your entire purchase!! Under Armour sells shoes, shirts, and everything athletic. This discount is for active duty, reserve, veterans, and family members. Police, Firefighters, EMT, and other first responders also qualify for the discount. How to get the discount in-store?? Just bring your Military ID card. How to get the discount online?? You have to visit Under Armour's website. 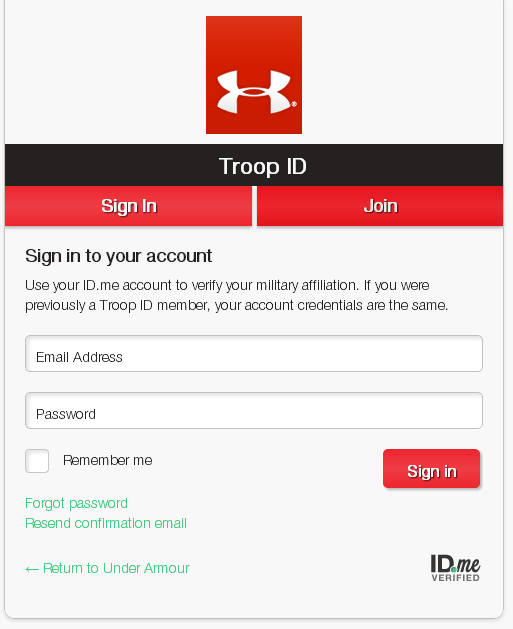 There you can sign up for Troop ID which can be done during the checkout process. I will outline the steps below. First add anything you want to your shopping cart and say checkout. During Step 2 of the checkout process "Review and Pay" you can click on the TroopID button under the promo code section. 10% UA Discount For Military & Current EMT-Certified First Responders. Shop UA Golf + Enter to win an exclusive Jordan Spieth UA Golf Pro-Pack, including top tier gear & a $250 UA Gift Card. Like what you are reading? Want in on more Military Discounts? ?